Raw kefir yogurt is probiotic heaven! I used raspberries but the possibilities are endless. If you make your own kefir from live grains, you must try this. 1. Let you kefir sit long enough with the grains to get pretty thick, yogurt-like. Remove grains. 2. Dump it into a nut milk bag or cheesecloth and strain out the whey. KEEP THIS! Whey is good for many things. If your trying to gain muscle this is the real deal, no powder you can buy will increase you muscle mass like this stuff. 3. 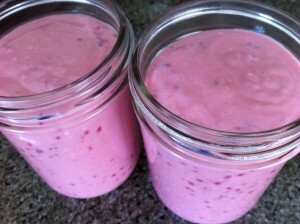 Mix the strained kefir with thawed frozen berries or fresh fruit. I used about 2 cups of raspberries to my 5 cups of strained yogurt. Again get creative here, mix to your own taste. 4. Add raw honey to taste, I used about 1/8 of a cup. Store in the fridge, best if used within 5 days, I think it lasts much longer though.